In 2001, I had an opportunity to fish several dayswith Homer Circle. We were on Mexico’s Lake El Salto, one of theworld’s top trophy-bass lakes, filming a TV show.But Uncle Homer, as his friends always called him, arrived three dayslate because of a stomach illness. When he finally arrived at the Mazatlánairport after a long flight from Florida, no one was there to pick him up. Theairport closed at 10 p.m., but the driver who was supposed to get Homer hadforgotten, and Homer sat on a bench outside all night before the apologetic manarrived. I had already been fishing on El Salto three dayswhen Uncle Homer arrived, but fishing was poor. I hadn’t caught manyof the lake’s famed largemouths,and those I had caught were small. I met Homer as he arrived at the camp, and becausehe had been ill several days and hadn’t slept all night, I expectedhim to want to rest a while. On top of that, he was 86 years old. Ididn’t figure a man his age would be eager to fish after his ordeal.But he was. With that, we were off. And half an hour later,Uncle Homer landed his first El Salto bass — a 10-pounder —on his very first cast. Before the afternoon ended, he caught a dozen moretrophy fish, including some of the biggest bass I’d everseen. I tell you all this to show you what an incredibleangler — and person — Uncle Homer was. He lived in Arkansasonce and had been appointed to the Arkansas Game and Fish Commission where Iworked. When he learned that as we were introduced in the 1980s, we becameinstant friends. We often corresponded by mail or talked on the phone. He wasone of my most important mentors. I say “was” because Uncle Homerpassed away in 2012 at the ripe old age of 97. He remained an active angler andwriter until his death. He fished for everything that swam on trips that tookhim to four continents, but he is best known for his influence in thebass-fishing world. He was one of the most popular, prolific andinfluential bass-fishing writers in the history of the sport, with a column thatran from 1968 through 2002 in Sports Afield. He also wrotenumerous books on bass fishing, including The Art of PlugFishing (1965), New Guide to BassFishing (1972), Worming and Plugging forBass (1972), Circle onBass (1996) and BassWisdom (2000). He was inducted into the Bass Fishing Hallof Fame in 2001. Fortunately for me, and for you, Uncle Homer lovedsharing his endless knowledge about catching the bass he so dearly loved. 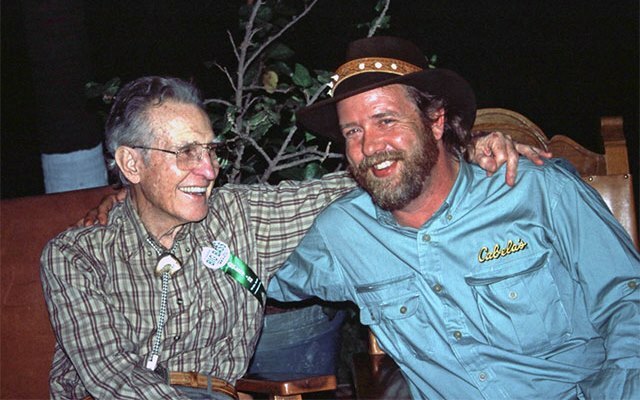 Andduring those days together on El Salto, I had the opportunity to record severalinterviews with him about bass fishing through the seasons. One of those interviews seems particularly timelyto share, one where Uncle Homer, in his down-to-earth style, discussed methodsfor catching largemouths during the fall turnover period. I share it with younow. “Turnover time is short butsweet,” said Uncle Homer. “It’s caused by theoccurrence of early winter winds. They pound waves against shorelines and chillsurface waters to make them heavier. Water reaches its weightiest point at 39.2degrees. Big bass sense this oncoming annual period andinstinctively respond. Circle told me catching these bass requires theangler to develop two mind-sets. One is to imagine cruising bass looking for aschool of oversize minnows or shad. The other is to picture bass in seclusionafter gorging on a belly full of prey. “For cruising bass, thinkdeep,” he suggested. “Look for dark drop-offs around oldcreek channels, bluffs, steep points, cliffs and railroad trestles. This callsfor lures designed to work at deepest depths. For bass in seclusion, Uncle Homer recommendedlooking for dense weeds, lily pads, brush or other heavy cover abutting darkwater, and think “s-l-o-w!” This calls for lures that havedo-nothing appeal at idle because a belly-full bass won’t chasethem. “Especially try verticaljigging,” he said. “Rig a soft-plastic crawfish body on a1/2-ounce jighead. Mosey quietly along deep shoreline covers with a verticalline suspending the lure from top to bottom. Lift and lower it gently,s-l-o-w-l-y, temptingly, to trigger instinctive slurps from non-hungrywhoppers. Keep your eyes locked on the line where it kisses thesurface.